Moving a large piano is a tenuous and tedious process. 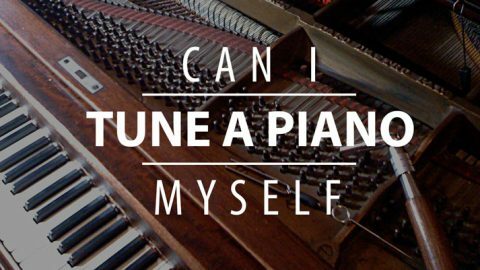 In fact, pianos can weigh anywhere between 300 to 1,000 pounds. Whether you’re rearranging your furniture or moving to a new home entirely, moving the large and bulky instrument can be tricky. If hiring professional movers isn’t in your budget or timeline, there are several steps you can take to make the impossible possible. If you’re not sure where to begin, we’re here to help. First and foremost, you’ll need to make sure you have the necessary supplies and materials to safely and securely move the piano. Step 2. Enlist a team. Like we mentioned above, moving a piano is no easy feat. With that being said, we recommend enlisting a team with serious manpower. Depending on the size of the piano and the scope of the move, we recommend finding at least four or more people to help. Create a crystal clear moving plan that consists of exact measurements and an intended route to minimize damage to the piano and surrounding walls and floors. Plus, move aside any furniture or rugs that are in the way of your path. Moving your piano requires a well-thought-out plan. To begin the moving process of your piano, lower and secure the top lid. If you can, disassemble the piano legs and pedals with a screwdriver and wrap them into a separate moving blanket. 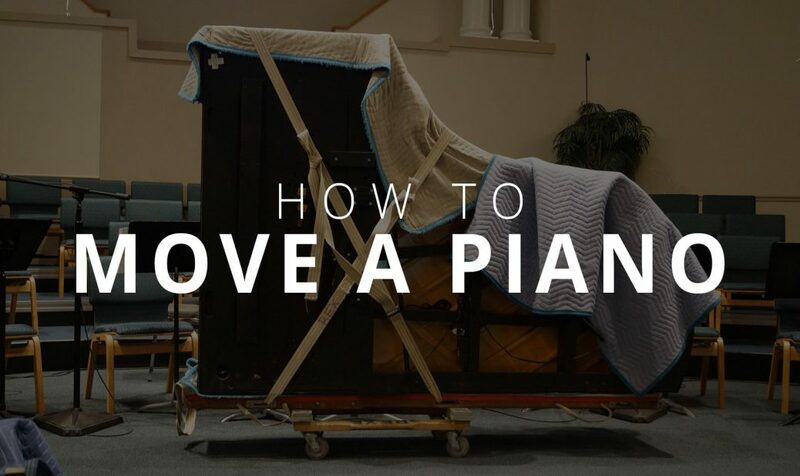 Take your extra blankets or padding and wrap the entire piano, ensuring that every corner is protected. Secure the blanket with packing tape. Once the blankets are taped and secure, hoist the piano onto the dolly. Using moving straps or rope, tie the piano down to the dolly. Tighten the ratchet strap to ensure there’s enough tension. Make sure to take safety precautions by having someone on each side of the musical instrument. If you need to carry the piano up or down stairs, you’ll need to rent a metal stair ramp. Although moving your piano across the room is an easier task, it can be surprisingly dangerous. If you’re dealing with a grand piano, you may be able to use the wheels to get it where you want. Since upright pianos are smaller than grand pianos, they’re easier to handle. Keep in mind, however, upright pianos are top heavy, which means they’re more prone to falling sideways. 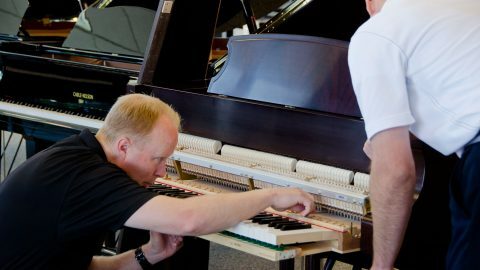 Hire a Professional Piano Mover – Contact Ogden Piano Gallery Today! At Ogden Piano Gallery, we have our own in-house professional piano movers with the ability to move your piano safely and efficiently. You’ll have peace of mind knowing your piano or organ will be safely moved. 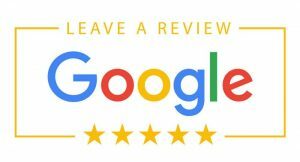 Contact us today at 801.779.9700. 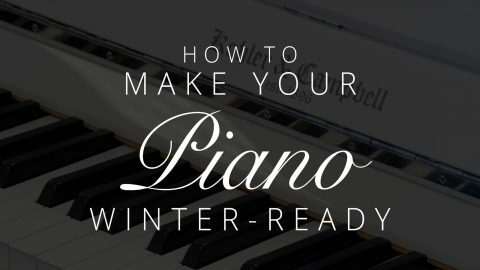 How to Make Your Piano Winter-ReadyCan I tune a piano myself? Earlier I didn’t realize that pianos were so heavy! But now I know Piano moving is an art. It makes sense why my mother would prefer to have a professional handle moving her piano instead of letting me do it. At first I consider piano moving as an easy task. But at the time of moving I find out that this job really need some professionals who can move without damaging the piano and now I really suggest to have professional hired for piano moving.